Do You Dream of Making Money from Your Blog? Welcome to ProBlogger – the home for those wanting to start a blog, create great content and grow their blogs and then go professional to make money blogging. If you dream of making a living from blogging then you’re in the right place! ProBlogger is all about inspiring, teaching and supporting bloggers from around the world to create blogs that not only serve their readers and make the world a better place – but which build income streams for the bloggers behind them. My name is Darren Rowse and I started blogging in 2002 on an impulse one afternoon having seen a blog written by a guy on the other side of the world and witnessing how he used it to amplify his voice and grow a community around his ideas. I liked what I saw and decided I wanted to give blogging a go – not knowing that that decision would change the direction of my life in many ways. My first personal blog grew in readership in the coming years to several thousand readers a month and gave me confidence to start numerous other niche-focused blogs which in the hope of paying for my server expenses I started to teach myself to make money from. The income from those blogs was small at first – just a few dollars a week at first – but gradually grew to become a part time job and then in late 2004 to be a full-time income. Around the time I achieved a full-time income from blogging I started ProBlogger as a simple blog to share what I was learning about monetizing blogs and in the hope of meeting others on the same journey. While a blog about blogging may seem a little sad – it turns out that many others shared my dream of making a living by writing on topics that they are passionate about and ProBlogger quickly grew to be a center for learning for hundreds of thousands of bloggers from around the world. ProBlogger is now so much more than a blog. The blog itself has almost 8000 articles and tutorials but on this site you’ll also find my podcast, a Job Board for bloggers looking to find work, a series of ProBlogger eBooks and the ProBlogger Book – plus much more. Most new readers to ProBlogger come with the dream of building an income from blogging but also with one of a few common needs or challenges. You’ll find these highlighted under the heading ‘I need help to…’ on our front page and the sidebars on this site (as pictured right). 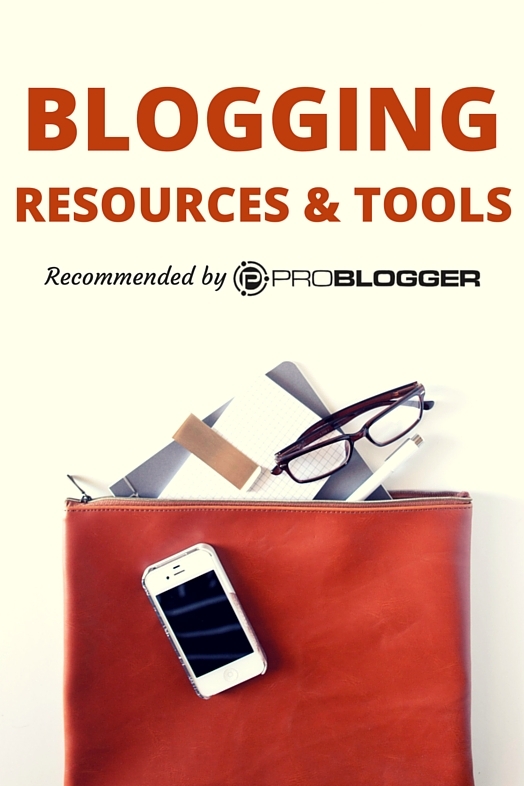 Also a popular page on ProBlogger is our Recommended Blogging Resources page which contains all our recommended blogging tools, services and apps to help you keep your blog running smoothly. The best way for you to stay in touch with ProBlogger is to subscribe to our free weekly newsletter. We call it ProBloggerPLUS and it is filled with all our latest tutorials, podcast episodes and other news from the ProBlogger community. I trust that you’ll find ProBlogger to be a useful resource for you in your blogging. Please feel free to join in on the many conversations happening around the site in our comments section and drop me a note any time on our social media pages – I’m particularly active on Twitter and Facebook and look forward to connecting. A list of recommended blogging resources that I’ve either personally used (in most cases) or which have come highly recommended to me by people I trust.